About Pearls for Women helping women, one woman at a time. Educating Women, Connect, Inspire, Enhance the lives of women. Pearls for Women is a service organization designed to help women, one woman at a time. Founded in early 2008 by Lanette Jarvis, Eva Krzewinski, and Denice Brown, three partners who all have a strong desire to teach women how to help when she finds a women in need. Pearls’ mission is to educate, connect, inspire and put women in touch with resources beneficial to enhancing their lives, businesses, careers, and community connections. The goal is to empower and reward and women who help each other with a symbol of a pearl bracelet, called “Pearlizing”. 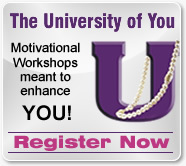 Pearls for Woman can help you find a speaker for your next workshop, seminar, or conference. Their years of experience in their own fields give them expert status. The Pearls moot is, if we don’t know your subject we can find someone who does. Being connected is the name of their game and they love to share their contacts with others in need of help. Drop us an email and we will contact you to collaborate on meeting your needs. The partners of Pearls for Women love educating and connecting women to each other. They do this through a series of workshops called “The University of You” always featuring a team of experts that teach attendees how to enhance their work skills making them invaluable in today’s workplace, job market and in business. Workshops are generally geared toward actions that will help women set themselves apart from the rest dealing with career strategy, business strategy, customer service, sales techniques, becoming networking experts, and how to give back to the community in order to fulfill heart strings as well as purse strings. Pearls for women are very community minded and give of themselves to others. They work with local and national charities and organizations that help the community in all degrees, but specifically for women and children. Together they have chaired, hosted, and volunteered for over 600 Orlando area events. Pearls for Women will work with an organization to create and manage events to maximize attendance, community awareness, sponsorships, in-kind donors of goods from restaurants to live auction items as well as increase volunteerism in the organization. Building hospitality partners is our specialty and when all is said and done the partners will help year after year. Low cost programs are available and when Pearls for Women create the hospitality partners for the organization the expenses will be considerably lower if not at a zero cost. Harriett Lake’s Favorite Things benefitting the Ballet and raising over $15,000 at a luncheon setting. Women of Distinction, Girl Scouts of Citrus Council event honoring area women for their achievements and work in the community, over 500 attending. Eva Krzewinski – Has over 25 years experience in Motivational and Educational Training. She is a past state President for Business and Professional Women for Florida and currently holds the office of President for the Orlando Chapter for the 2nd time. She has trained executives and staff for companies such as JB Morgan Chase, Bank One and Bank of America. Also she has written and taught training programs to national companies such as Comcast, Bright House, Mary Kay, Clemson University, and locally, the Orange County Government. Eva through volunteering and leading organizations and charities is an accomplished event chair, hosting and planning over 500 Events and Conferences from 20 -2000.Her partners and associates deem her “The Teacher” due to her innate ability to make any subject understood by all who listen. Lanette Jarvis – Has over 30 years experience in the hospitality industry working for Ruth’s Chris Steak House in various roles such as Operations, Training, Marketing, PR and Community Relations. She spear headed Ruth’s Chris participation in the Great America Dine-Out for several years but is especially proud that in honor of her Hometown, New Orleans, she helped create the RC program and then motivated all participating Ruth’s Chris locations to raise over $75,000 in a single night for Share Our Strength - Katrina project. This event was near and dear to her heart because in the after math of Katrina, she was given the task of communicating, finding and relocating over 600 Ruth’s Chris employees. Although she worked tirelessly to perform her task, it will remain one of the most rewarding accomplishments of her career at Ruth’s Chris. Her partners and family deem her “The Fixer” because she has never met a problem she cannot solve. Denice Brown – Has over 32 years in the employment industry and owned a successful staffing Agency in New Orleans prior to Katrina. Her ability to council women on transition plays a valuable role in Pearls’ mission. Her specialty is teaching women how to stabilize their lives after minor and major happenings such as job loss, divorce, death of a loved one, business closure, and empty nest syndrome. Her partners and family deem her “The Listener” because she has a natural ability to hear what a woman is saying and determine the best advice to help her in whatever she is trying to accomplish or sort out. Just like the Live Strong bracelets created and sold by Lance Armstrong in honor of Cancer research, Pearls for Women has created a symbol to recognize other women who help each other and have also learned how to ask for help when she needs it. Women are taught to be the nurturer, it is innate that they always take a back seat and feel like they have to be Super Moms, Super Sisters, Super Daughters, Super Wives, Super… well you get the point. 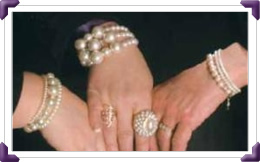 Pearls for Women began presenting woman with a pearl bracelet as a symbol of power and they called it Pearlizing. Women wear pearls when they want to feel powerful, beautiful and strong. When a woman is pearlized wearing her bracelet to business meetings, social events, even to the local grocery store to remind her that she has the power to help and the courage to ask for help when she needs it.